Once an expensive and futuristic dream, the technology for Internet–based collaboration is now available and affordable — and more practical than you might think. We producers, musicians and engineers need to interact with a huge number of potential colleagues. This used to mean meeting people face to face but much of this interaction, including the recording sessions, can now take place via the Internet, without anyone having met in person. Some might prefer to do things the old way, but the benefits of long–distance collaboration are easy to see: the ability to tap into a global network of performers without leaving your studio, which can be anywhere, is a tantalising prospect! In this article, I’ll explore the options and pitfalls of this brave new world of remote collaboration. Little more than a decade ago, remote collaboration (RC) seemed an expensive, if not unattainable dream. The infrastructure was costly to install and maintain, and the setup required specialised technicians and equipment. Studios at both ends required ISDN technology and the reliability of these systems wasn’t always great. In fact, the financial cost of installation and maintenance would often be greater than that of flying the artists and performers in for a session, but the ‘future is here’ cool factor of Transatlantic sessions meant high–end studios could pass the costs on to high–calibre clients, who could command big production budgets. ISDN (see Hugh Robjohns’ SOS April 1999 feature: http://sosm.ag/apr99-ISDN) remains in use, particularly in the broadcast sector, where there’s commonly a need to facilitate real–time collaboration between multiple parties in several locations. For the rest of us, the advent of affordable and fast Internet connections, and the proliferation of reasonably priced recording equipment, has changed everything. The last few years have seen long–distance recording projects using this technology blossom, and not only for the hobbyist: the steady decrease of record–production budgets across the board makes the RC approach particularly attractive to commercial artists and producers, as work can often be completed quicker and more cheaply. But while this financial efficiency is a factor, there’s a much greater benefit: it’s now possible to access an almost endless pool of creative and musical talent that would be impossible to utilise if everyone had to be in the same room at the same time. For example, I live in the States, but during the last five years I’ve collaborated with Lou Salloum, a very talented producer from Beirut, Lebanon. He contacted me because he’d been impressed by a demo and a series of tutorials I’d created for IK Multimedia’s Philharmonik orchestral library. We hit it off and have collaborated a lot since then — yet we’ve met only twice in person! We just could not have found the time or money to hook up in the same location, so without an RC approach, our projects simply would not have come to fruition. First, of course, you need your own project studio, and while this could, in theory, be little more than a laptop and a mic, potential collaborators will have expectations. It should go without saying that your audio equipment must be of professional quality, up–to–date and in good condition. That applies to any collaboration, remote or otherwise. But it’s arguably more crucial to have a system that works smoothly for remote work, as glitches have greater potential to put a stop to the creative flow. The engineers among us won’t need telling, but if you’re a performer seeking to be hired for long–distance sessions using your own project studio, you really do need to be able to record your instrument or voice well. I speak from experience when I say that, technical gremlins aside, there’s nothing more frustrating for a producer or composer working remotely than being let down by a great performer who cannot deliver a good-quality audio recording. Not only is it crucial that you have a high–quality audio interface with decent A–D converters and mic preamps, and at least one high–quality mic that’s appropriate for recording your instrument (I’d strongly recommend you have more than one), but also that you can use this gear to capture a good sound! Your DAW software choice is a personal one but unless you’re only planning on working on one specific project (with bandmates, for example) do adopt a platform that’s widely used. It’s much easier to work with a client who is far away if you both work on the same platform, as this will minimize conversion time and confusion when exchanging sessions, and can mean that you don’t have to keep bouncing and uploading huge WAV files. If you want to work professionally on a range of projects, Pro Tools remains a good choice, simply because of its widespread adoption in professional studios. Apple Logic seems to be increasingly popular in professional circles, as, in some regions, do Steinberg’s Cubase and Nuendo (as we shall see, musicians can use the free VST Connect application to communicate with these, even if they don’t use Steinberg’s DAWs). There are plenty of other options, including MOTU Digital Performer, Cakewalk Sonar, Ableton Live and Cockos Reaper, just to mention a few that I’ve used. I won’t tell you which to use, but do make sure you consider the consequences of your decision. 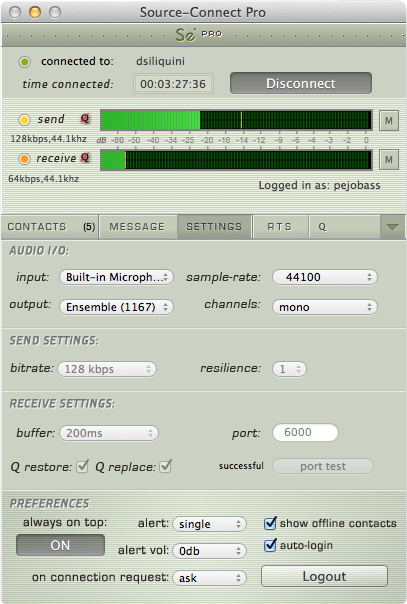 Download speeds for a one–minute session of 24 tracks recorded at 44.1kHz/24–bit resolution. There are no prizes for guessing that the speed at which your studio is connected to the Internet is hugely important if you want to work remotely in real time. A slow or unstable connection will most likely mean you can’t provide a satisfying experience for your client or collaborators. Even for offline collaborations, a slow Internet connection can break the creative flow and slow down the production, simply due to the quantity of data you’re going to be moving around on a regular basis. 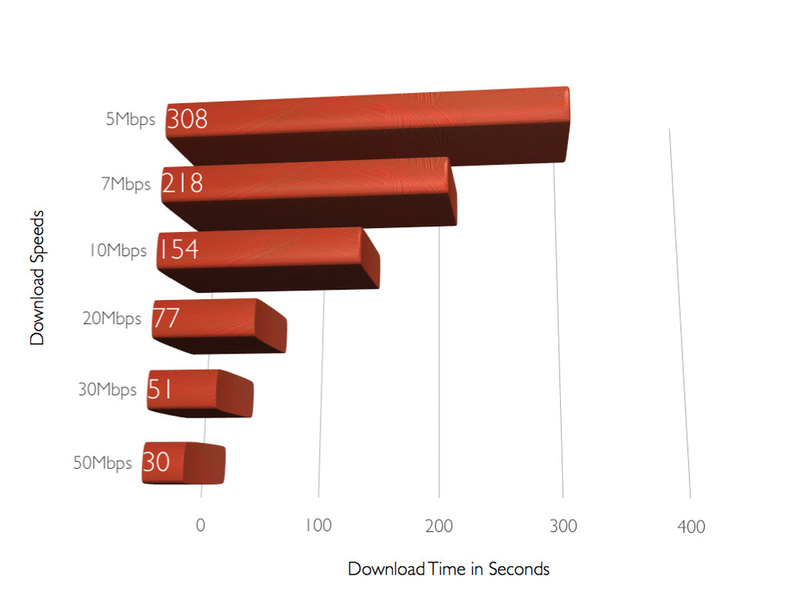 Most of us pay more attention to the download specifications of our connections, partly because we usually use the service to download large software updates, or audio/video for entertainment, and partly because that’s the figure that the providers always quote. Yet the upload speed is just as important: to work with an artist or a client who is on the other side of the world, not only will we have to download their tracks, but we will also have to upload our mixes and tracks for them for further overdubs or for final approval. In the USA, typical cable and fibre–optic home services range from 15 to 50 Mbps for download and 7 to 15 Mbps for upload. I recommend that you choose a service that provides at least 20Mbps download and 10Mbps upload speeds. Note that the headline advertised download speeds aren’t usually indicative of the real–world speeds you can expect. In the UK, for example, many services are still provided via copper lines, and the further from the telephone exchange your studio is, the slower the speed will be. Also note that the actual speed will often depend on how many other people are using the broadband on the same connection (something known as the contention ratio). Usually I find that the upload is more time–consuming and frustrating if the upstream speed is not fast enough, which makes it all the more frustrating that upload speeds are often restricted by domestic broadband providers in order to make greater bandwidth available for downloading (it’s what most customers want). So, depending on where you live and how you plan to collaborate, you might find yourself requiring a ‘business’ connection, or needing to find a less mainstream provider who uses a different technology (such as high–capacity local wireless networks — note that despite the high speeds of satellite Internet services, the inherent latency may prove frustrating) and doesn’t limit on your upload speed so severely! Remember that it’s not just the connection speed that’s important, but also what you might be sharing your connection with. If, for example, you’re working in a home studio and someone else in the house is watching TV, streaming videos or whatever on the same connection, then they’re eating into your bandwidth. You might have enough left, you might not, so be aware of it! Similarly, it’s easy to have browsers, Skype or other bandwidth–hungry software open and making use of the connection without you realising it, so make sure they’re closed while you’re working on a remote session. Pay attention to the quality, speed and number of Ethernet ports of your broadband router. And avoid wirless connection: if you’re experiencing problems, it could be the weak link in the chain!The quality, speed and reliability of the network connection between your studio computer and your Internet connection is also important. You must have a good, stable router and a computer that has at least one Ethernet port — and more than one if possible, particularly if you’re planning to run additional machines to host resource–hungry orchestral libraries, or to use things like Avid Control surfaces (or anything else that connects to your machine via Ethernet). If possible, also choose a router that has more than one Ethernet port. Although the Internet connection will usually be the cause of any data–transfer bottleneck, I’d still suggest connecting your main machine(s) to the router at the fastest speed possible, which is likely to be Gigabit Ethernet (GigE). Note that although GigE is pretty standard nowadays, there are plenty of routers that don’t offer it, and while GigE is backwards compatible with 10 or 100 Mbps devices, you need both devices to be GigE–capable to make use of the faster connection. Apple’s AirPort Extreme provides excellent performance and reliability, not to mention very easy setup, but if your studio is Windows-based you could consider a range of brands. 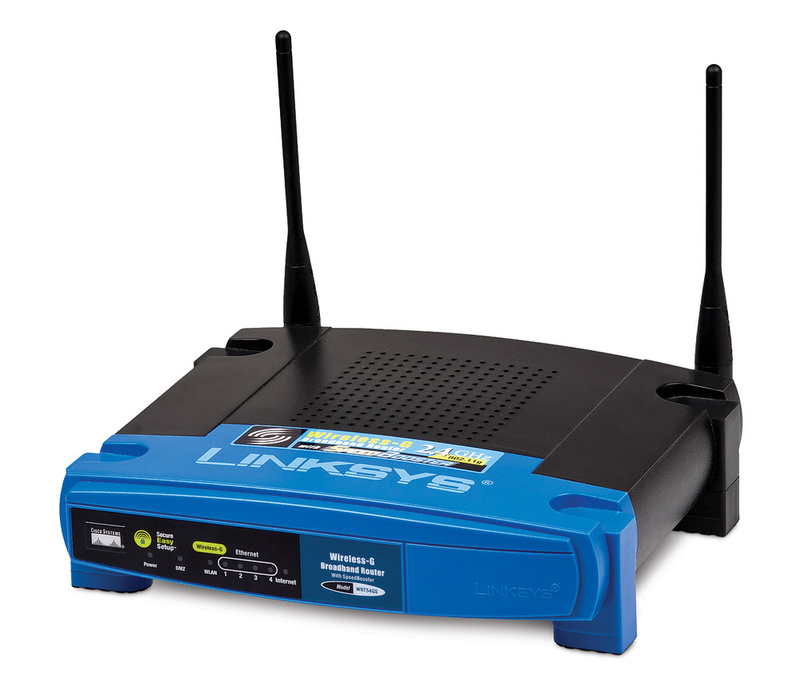 I’ve found that pretty much any high–end router from a reputable brand (such as Netgear, Buffalo or Linksys) will perform well and be fairly stable. A final recommendation about network connections is that if you’re at all serious about real–time remote collaboration, you should avoid using Wi–Fi to connect to your router. Although the actual transfer speed of the latest wireless standards (such as 802.11ac, which has a theoretical top speed of 1.3Gbps) can theoretically handle real–time recording and playback, wireless connections are notoriously less reliable and less consistent in their data handling than wired Ethernet. With your infrastructure sorted, you can start to evaluate the software packages that are designed for managing your RC projects, but before diving in, consider what approach to collaboration will best fit your way of working. Each system can be assigned to one or two of three broad categories: real–time, offline, and simple file sharing. 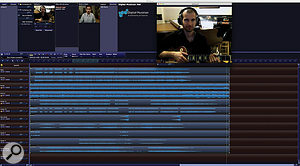 Real–time: Real–time collaboration software allows you and your collaborators to interact with each other in real time via a linked DAW session, and usually enables you to see each other via a webcam and talk to each other too. In most implementations, the project session and its audio files reside on local machines, rather than on a server somewhere in the cloud. The cloud is used to synchronise the participating machines. Usually these applications are embedded in a DAW (as with VST Connect in Cubase, for example), or run in the background (through ReWire or other similar protocols), handling the network sync’ing and data exchange, and passing the audio information to the local DAW engine. Some have a master session with one DAW and a ‘lite’ version on other machines on the network. I’m afraid that in this context the real–time element only usually applies to two collaborators at any given time: while more of you can be logged on and can communicate in real time, you’re going to be disappointed if you were planning to track five band members simultaneously, with each in a different location. I’m sure that will become possible given time, but for now you’re going to need to overdub. Offline: Offline collaboration software allows people working on a session to interact without all having to be ‘present’ at the same time. Each contributor can upload, download, comment and make changes to a session independently from the other collaborators. The master session typically resides on a server in the cloud, rather than on a local machine or machines. The integration with established professional DAW software is usually limited. A variation on the offline approach is the use of a hybrid collaboration tool, in which the master session resides in the cloud, but is updated locally every so often, thereby giving the impression of real–time workflow. Simple File Sharing: You’re probably familiar with the idea of projects based on file sharing, as these utilise more generic web, email or cloud–based tools such as Dropbox or Google Drive, or slightly more specialised ones like Gobbler (see below) for the session and audio file exchange. The majority of these tools offer no direct connection with a DAW (Gobbler is an exception, as it is already partially integrated with Pro Tools and Sonar). The contributors exchange files by up/downloading tracks and/or project sessions to and from storage in the cloud. The integration with a DAW is basically manual; you must manually import/export, copy and move the files around your computer, so the key to making this work is being organised! Often, it’s easiest to do this if you use audio files all with a common starting point (ie. bar 1, beat 1), but that often leaves you dealing with larger files than are necessary with other approaches. It might not seem the most hi–tech approach, but if it suits the way you work don’t dismiss it, as it’s about as reliable a system as you could wish for. Another way to think about the software is to consider whether you want a system that is synchronous or asynchronous, two fancy–sounding terms that describe fairly simple concepts. A synchronous system allows for simultaneous collaboration, in which all, or at least some, of the project’s participants need to be ‘present’ at the same time in order to work on the session. An asynchronous system still facilitates remote collaboration but it doesn’t require the participants to work at the same time: each party can work on the session independently, adding and updating their parts of the combined master project, which usually ‘lives’ in the cloud. Each has pros and cons, so it’s really up to you to evaluate what works best for you based on your type of project, client and creative workflow. In my experience, synchronous tools have the big advantage of allowing collaborations that are more similar to those you’d have if all the participants were in the same room: you can give immediate feedback, and offer quick advice about a particular performance, passage, phrasing or miking technique. A synchronous tool can thus give you much more immediate control over the outcome of the session than an asynchronous tool can. There are trade–offs, though. The setup of a synchronous tool is more complicated (in some cases a special firewall configuration must be put in place). Network and Internet access speed requirements are usually greater, and multiple time zones can make scheduling a session more problematic. It’s also important to keep in mind that many such systems require each participant to have the same software version and licence, and sometimes even similar hardware specs. Asynchronous tools may seem inferior at first glance, but they have the big advantage of lower network and Internet speed requirements and, usually, no special firewall configuration. Feedback between artists, performers, engineers and clients can be exchanged offline in greater detail, and with the opportunity to carefully consider all the implications of a badly timed critique. With time to reflect, you’re less likely to inflict devastating effects thanks to a heated comment on the drummer not playing in tempo or a singer singing out of tune! If you’re working on productions that involve musicians living in time zones far apart, asynchronous tools are almost a prerequisite, because they allow everybody to work during their most productive hours of the day. Offline asynchronous tools also offer the potential advantage of adding a social network component to a project. You can ‘open’ your session to an entire community, or a more restricted group of trusted collaborators if you prefer, and let anyone contribute freely to your track. It’s an approach which presents some intriguing opportunities, but do make sure that rules and roles are established at the outset if you want to avoid a copyright nightmare somewhere down the line! A big drawback of asynchronous systems is that you must rely on the audio recording skills of the remote partner(s). While it’s fairly common to find musicians and artists who are great performers, it’s less common to find artists who are skilled recording engineers when it comes to recording their instrument or voice. And, as I said earlier, there’s nothing more frustrating than being left with a poor recording of a great one–off performance! With a real–time system, you’re better able to influence mic selection and placement, for example, as well as to discuss musical ideas. There are many different remote collaboration software tools available, catering for a variety of working styles, workflow habits and project types. I discover useful new tools on a monthly basis, and can’t hope to cover them all in an article such as this. For example, one of my colleagues has used GrooveZoo (www.groovezoo.com) for a couple of projects, but I don’t have direct experience of that service. Nonetheless, among the several platforms for long–distance collaborations that I’ve used, there are a few I can strongly recommend you consider and evaluate for yourself. The list that follows isn’t intended to be a detailed review, but it does provide a quick overview of their approach and some key strengths and weaknesses. Depending on your needs, I can recommend any of them as a good starting point. Source–Connect control panel and Link plug–in.Source–Connect (SC) is a real-time collaboration tool which has been around for several years, and is one of the most professional systems available. The company offer different applications/solutions that cover different aspects of RC, but SC is the most complete. In addition to the standard version of SC, there are two extra ‘flavours’: Pro and Pro X, the latter supporting up to six channels for surround work. SC is compatible with all the current and most popular DAWs. It requires an Internet connection with at least 300kbps upload and download streams. The system is based on an SC app, which runs in the background and routes the audio signal between your station and the one that’s connected remotely. One of the key benefits is that you can use your favourite DAW while working in real time. 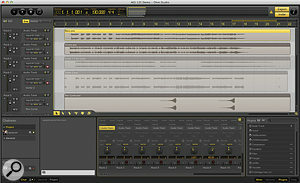 The SC application connects to your DAW through a plug–in called Source–Connect Link which is inserted on aux or audio tracks in your DAW. 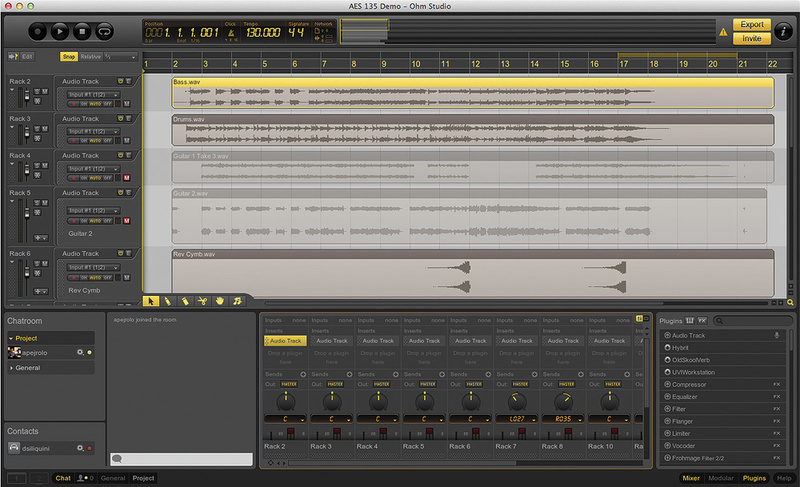 Through the Link plug–in you can route audio in (from the remote collaborator’s DAW) and out (to the remote machine). SC is a solid tool, targeted at a pro market, and once set up it runs smoothly and reliably. I found the routing a bit cumbersome, but the good reliability is worth the bother. Be prepared to fiddle a little bit with your router settings before you start working with SC. You must either have your firewall disabled or open the 6000 and 6001 ports using UDP port forwarding. If you’re not familiar with these terms, or are afraid of digging deep into your router’s configuration, you might want to use something a bit more straightforward! Also, in order to connect to a collaborator you need to have him/her as a saved contact under your account setting. I would suggest SC for sessions in which you need to be in direct contact with a client or a performer, and you need to recreate that familiar studio feel with collaborators around the world. Depending on how you use VST Connect, it could be classified as a real–time system or a hybrid real–time/offline system. With Steinberg’s VST Connect Pro, one person has VST Connect Pro running within Steinberg’s Cubase 7 (or above, or Nuendo 6) DAW software, and remote performers can contribute directly to that project via the simpler, free–to–download VST Connect Performer software. There’s also a free iOS app to which stereo mixes can be streamed. If you’re already using one of these two DAWs then VST Connect is a good choice, though you’ll need to convince your non–Cubase/Nuendo collaborators to install and configure VST Connect Performer. Thankfully that’s not a tricky task. VST Connect requires a minimum 256kbps upload speed. One of its big advantages is that it provides both audio and video real–time connections. Working with a remote artist whom you can actually see while performing is really exciting, and it makes long–distance collaboration a real pleasure. 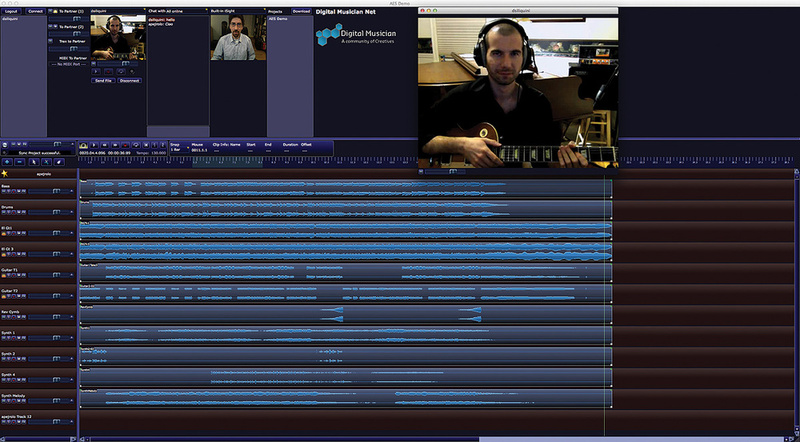 Steinberg’s VST Connect SE, in use during a session with guitarist, composer and producer Daniele Siliquini. VST Connect doesn’t require that you open any special port in your network, making setup fairly easy. In order to establish the connection you need to provide your remote collaborator with a number-based ‘key’ that is unique and generated for you for each session. In order to share the key you need to have access to the collaborator via email, telephone or some third–party social network, as there’s nothing like this integrated within the tool itself. The routing in Cubase can be a bit cumbersome at first, as a special bussing is needed in order to provide adequate monitoring for the remote artists. Fortunately, Cubase offers a preset template that facilitates track setup. Whereas the audio in VST Connect SE is always compressed (the user can define compression rates up to 320kbps, to suit their connection speeds), VST Connect Pro allows you to record up to 16 channels at once, with the stereo mix being monitored in real time and the PCM multitracks being transferred to the master project offline behind the scenes. It allows you to send and receive MIDI too. VST Connect SE 2 bundled with Cubase 7.5 and Nuendo 6; Pro $225 (requires Cubase 7 or Nuendo 6); Performer free; Studio Pass free. A project running in OhmStudio.OhmStudio is a relatively new hybrid real-time/offline tool that was only officially released in October 2013, though it was in public beta testing long before that. It’s a very interesting system that bridges the gap between a fully fledged DAW and a long-distance real–time collaboration tool. OhmStudio can work as a stand–alone DAW with both audio and MIDI tracks, and can use VST plug–ins and soft synths in addition to the bundled ones, but OhmStudio really shines when it comes to collaboration. When you start a new project in OhmStudio you have full control over who can access it and collaborate. You can have it open to everybody signed up in the OhmStudio community, or select specific trusted collaborators. Once the project is launched you can collaborate in a sort of ‘deferred’ real–time fashion. Basically, the idea is that everybody involved with the project can look at exactly the same session simultaneously, even though the session resides locally on all the machines of the people working on the project. The session is sync’ed through the cloud almost in real time. 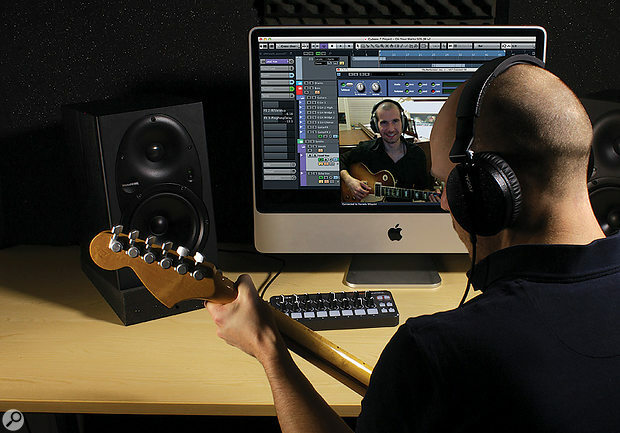 For example, if one artist is recording a guitar track, another participant can see that he/she is recording but doesn’t hear it in real time while it’s recording. The track is posted right after the performer presses the Stop button. I think that this solution is brilliant because its bandwidth requirements are lower than those of a genuinely real–time tool, yet participants can hear the tracks just seconds after they are recorded. OhmStudio also includes a chat window for quick interaction between participants and its interface is very elegant, easy to learn and navigate. There’s a free version and two paid versions, which allow 24–bit files and come with a selection of OhmForce plug–ins. There’s also free hosting of up to 10 projects, with a subscription model for unlimited hosting (which will be limited to 200 projects once an offline version is available). Free to €99, hosting from €7 per year. A session in Digital Musician with the author and Daniele Siliquini.Another hybrid tool, Digital Musician (DM) has been around for several years now (we first featured it in SOS at least as long ago as 2005), and was one of the first real–time remote–collaboration systems available to home–studio users. In a way, it offers an approach similar to the one used by OhmStudio, with the nice addition of also running as a VST plug–in inside your favourite DAW — in which respect it’s rather more like VST Connect. You join its service and its community online through their web site. Once signed in, you download their free virtual DAW (DMContainer) and/or their VST plug–in version (DMP). DMContainer serves the dual purpose of acting as the communication between the DM server, and providing the DAW basic functions. You must first create an online project via the Digitalmusican.net web site, and you can then download it to your local machine. After working on the project locally you can sync it to the DM servers so that other participants can see the changes you have made. Other collaborators can also download the session to their machines and record new tracks. New tracks can be sent directly to you or can be added to your local projects by re–sync’ing the session. DM offers a live video and audio feed and also a live chat. If you prefer using your own DAW, you can opt to use the plug-in. This is a very welcome feature since it allows you to combine the power of your DAW with all the features (including live video feed) of the Digital Musician system. A fully working but more limited service is free (limited storage and monthly data transfer, and no more than three projects), with such restrictions becoming far less draconian if you pay the modest Pro subscription fee. Free, or monthly subscription of €2.49 (about $3.40) for ‘pro’ features. 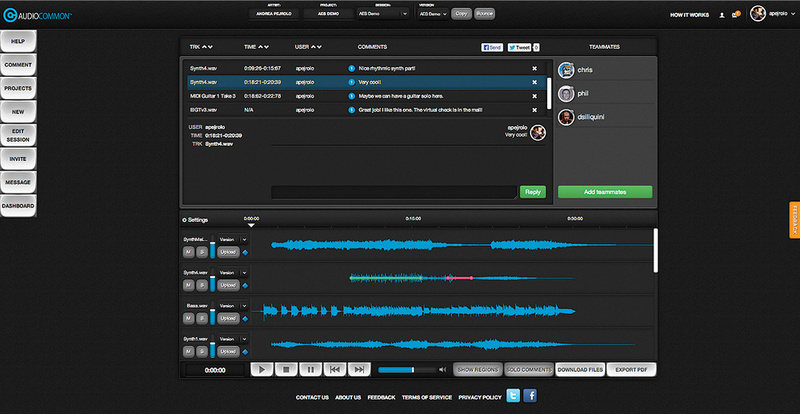 The Control Room view of AudioCommon.Boston–based AudioCommon offer a very clever and functional offline tool for RC. Instead of relying on complicated real–time software that requires intricate setup and configuration, their product is completely web–based. After signing up and logging in, you create a project (or multiple projects, if necessary) that you share with anybody with whom you need to collaborate. The sharing process is as simple as sending an invitation from inside the web interface. Think of a project as an album, in which you can have multiple sessions, each corresponding to a song. 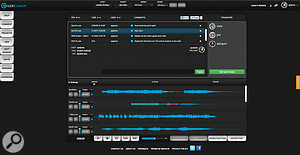 Anyone can upload stems or tracks to a session, with the option of adding different takes to each track. Everything can be done with no real–time interaction, making this tool an ideal solution for collaborations in which participants in different time zones are involved. One of the highlights of this tool is the comment/feedback feature. A participant can leave comments for an entire track and, even more interestingly, can add comments to a specific area of a track by simply clicking and dragging over a passage of a track or take (it reminds me a little bit of the way SoundCloud comments work). I find this both brilliant and intuitive. All the tracks can be downloaded to your machine for importing into your DAW of choice, and all the comments can be saved as a PDF file. AudioCommon also provides tools for scheduling and budgeting so that you can keep an eye on how your projects progress. I could list a whole load of generic file–sharing services here, and I’m sure you’re already familiar with services such as SoundCloud, which allows you to add comments to uploaded recordings, and to download hi–res versions of what is streamed (assuming you’ve uploaded a high–resolution version in the first place!). This is a vast subject, which I’ll leave you to explore in more detail. However, there is one such tool which I find particularly useful for audio collaboration. 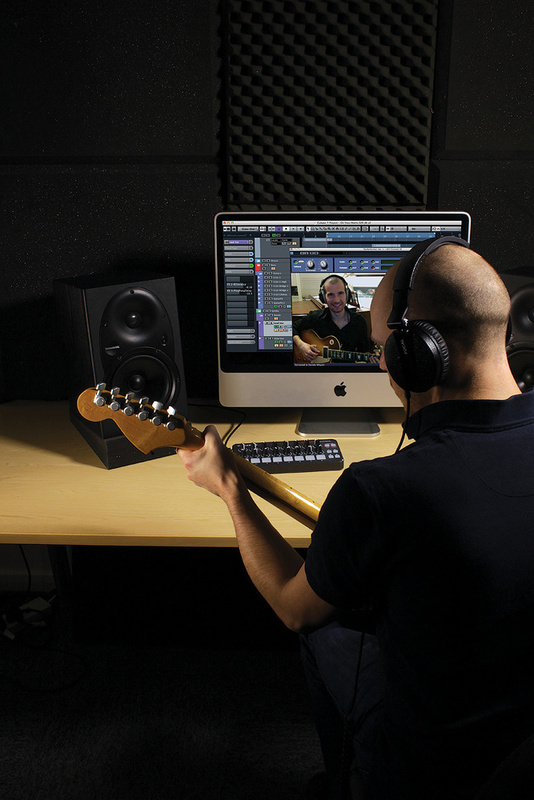 Exporting and sharing a session from Pro Tools via Gobbler.Like services such as Dropbox or Google Drive, Gobbler is based on a cloud storage and shared space system, and has a few capabilities that make it particularly attractive for musicians, producers and others working with audio and video media. First of all, it integrates directly with Cakewalk Sonar and Pro Tools, allowing you to share a project (and all its session files) directly from Pro Tools’ File menu — and Gobbler’s web site claims it will soon be integrated in other leading DAWs too. Gobbler also serves as a backup system for your important sessions and projects, automatically scanning your internal and external HD and backing up all or some of your projects to the cloud. If your DAW isn’t already directly supported, don’t worry, as you can still share your DAW projects by launching the separate Gobbler app on your machine. The interface is straightforward and the service is rock solid. The first 5GB of space are free upon registration, and after that you can buy more according to your needs. From free (for a 5GB allowance). As you can see, the tools and options now available for long–distance collaboration are generally easy to use and set up, have mature features, and are affordable. And as high–speed Internet connections become more widely available across the world, there is no reason for you not to at least experiment with some collaboration in which some or all of the participants join in from a remote location. Over the past four years, I’ve found that these types of collaborations have brought not only more exciting projects, but also helped me to expand my artistic and social horizons. If you feel like starting to collaborate on something, drop me an email. It’s great that technology now enables you to collaborate with skilled musicians from across the globe, but how do you find would–be collaborators? Some of the software tools discussed in this article — such as Digitalmusician.net, OhmStudio and GrooveZoo — come complete with their own social networks, and it’s well worth searching there for collaborators. But there’s no need to confine yourself to that — you can search in all the usual places like forums (in fact, we’re launching a dedicated subforum on the SOS Forum, which you can find at www.soundonsound.com/forum), local studios, music colleges, or just approach people whose work you admire. The only real difference is that geography is no longer an absolute barrier to them agreeing to work with you. When looking for collaborators online you will face some slightly different challenges, such as the quality of the performers, trustworthiness of the collaborators, and recording skills of the players you collaborate with, simply because of the number of people out there. Among the several services available online targeted to musicians seeking collaborators, I recommend giving Bandmix.com a try. This has a fairly large database and a decent interface, even though it is mainly used for live performance collaborations. Musicianwanted.org is another free option, but has a more limited choice in terms of collaborators and has a pretty basic user interface. Finally, Indabamusic.com has an intuitive interface, allows for live playback of tracks, and it is free. Real-time, Offline Or File Sharing? Direct interaction between artists, producers and musicians. Requires fast & stable connection. Possible timing & quality issues. Network setup can be complex (eg. firewall setup). All parties may require the same software. Performer can record while other production stages are happening. Less demanding on computer and network hardware. More time to consider feedback style. Short Internet dropouts won’t affect recordings. Recording quality depends entirely on the performer and their studio. Social component raises potential sharing and copyright concerns. More time to consider your feedback style. Integration with DAW software is extremely limited.